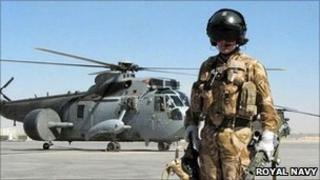 Defence Secretary Liam Fox said 3 Commando Brigade would lead the next deployment of British troops in Helmand Province. It is the largest mobilisation of troops from the South West since 2008. The battle group will include personnel from the Royal Marines, Army, Royal Navy and the Territorial Army (TA). The Royal Marines contingent will include Plymouth's newest commando unit, 30 Commando Information Exploitation Group, 42 Commando from Bickleigh and the Commando Logistic Regiment from Chivenor, north Devon. Army personnel will include 29 Commando Regiment Royal Artillery, based in Plymouth, 24 Commando Engineer Regiment from Chivenor and 1 Rifles, which incorporated the old Devon and Dorset regiment and recruits soldiers from across the South West. There will also be TA soldiers from Exeter-based 6 Rifles. The Royal Navy will be represented with personnel from 854 and 857 Naval Air Squadrons from Culdrose in Cornwall.